WHY WASATCH? Because it's easy to get high quality film output with the minimum of fuss. Because it's capable of high level tricks. Because it comes with expert backup to help you get the best from it. 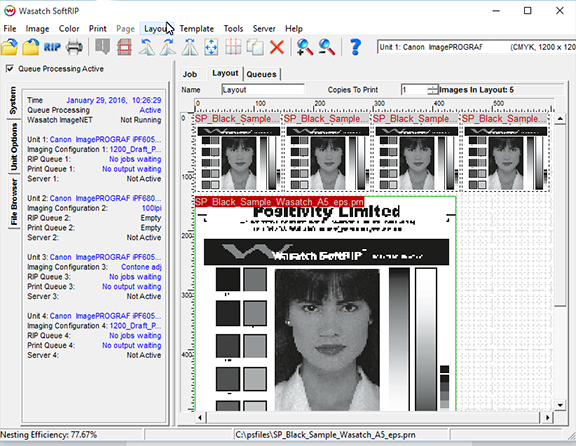 SoftRIP has been developed for use with Agfa SelectJet & Agfa CopyJet film. Print high quality screen films. Print cololur posters etc. Produce colour 'proofs' with halftones. Produce progressive 'proofs'. We give on-site training and telephone support open 14 hours/day every day so you aren't alone with any problems. It's so easy to get high quality positives from your printer. Wasatch has been developed over many years especially for screenprinting applications and we have been involved throughout that process, that means it's very reliable and we can support the RIP at all times. Wasatch SoftRIP is the industry-leading RIP for screen positive film separations, developed over many years as an integral part of the RIP, not just an afterthought. 4 colour prints - index separations - spot colours - stochastic dot/FM screening. 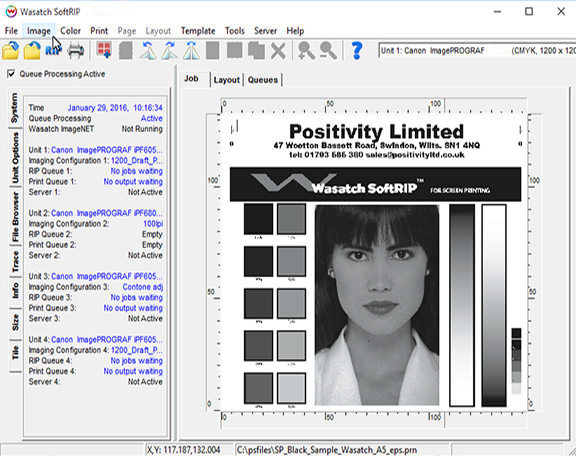 It's extremely user-friendly, yet has advanced functions that give total control over your imagesetting. Just pull up your file, add to layout if required and press print. We'll configure the system so that it works for you and support you through the learning process and beyond. Upgrade from your current version.